Today's trip was into Bridal Veil Basin, on the south side of the box canyon that holds the town of Telluride where we were staying for the week. The three peaks I had in mind can be more easily reached from the east via dirt roads off US550, but that would entail a hugh amount of driving from Telluride that was hardly necessary. Even by the longer route, the outing would amount to only about 12mi and most of this would be on trail. Looking for a shorter outing, Eric and Steve planned to hike up the basin to the Lewis Mill which had some some stabilization work done in 2001 to shore up the impressive structure which still contains the original stamp mill and other 100yr-old machinery of a bygone era. We drove up Black Bear Pass Rd to the site of the Bridal Veil power station at 10,400ft and started from there around 7a. I didn't stay long with my compadres as I needed to move faster to get back for our 2p meet-up. I followed the road/trail up the Bridal Veil Creek drainage, taking a fork that followed the east side of the basin where the main creek flows. The road ended where a water pipe can be seen rising through a small gorge to the south. A touch of the pipe revealed that water was flowing in it, probably used downstream as part of the hydro power station. I followed the pipeline upstream into the gorge, walking along a section of it near its start at a small dam in the gorge. Though the pipe appears old, many of the riggings used to hold it in place look newish, a sign of continuing maintenance. Above the small dam is the site of the Lewis Mill which I passed by on this visit without going inside. The upper basin here is treeless but green and vibrant with many hues of flowers enjoying the morning sunshine. I hiked past Lewis Lake above the mill, then higher to the trail going over the pass between Bridal Peak and T12. This leads into another basin on the east side of the crest where the two unnamed summits I was after are located. I left the trail to follow a cross-country route to Columbine Lake which sits at the foot of Peak 13,300ft. I found several groups camping here, or rather packing up from camping here overnight. The gentleman I talked to described the series of rainstorms that occupied much of the previous afternoon and evening, but he seemed upbeat with the better weather today. I crossed the lake's outlet and hiked up to the saddle between the two peaks, following Peak 13,159ft's class 2 West Ridge to the summit by 9:40a. There were fine views from the summit in all directions, particularly looking south and west. US550 could be seen only a few miles away in the canyon below to the northeast. And nary a cloud in the sky at the moment. A PVC tube held another register fail, with soggy, unwritable contents and the very bland CMC log format. I returned back to the saddle I had first ascended at the end of the West Ridge, then continued up on the connecting ridgeline to Peak 13,300ft. This was a dicier affair with steep, loose class 3 in places along a fairly direct line towards the summit, but certainly not the easiest way to get there. I was surprised to find two ladies at the summit when I arrived around 10:20a. After ascertaining that I had passed by them earlier at Columbine Lake, we spoke briefly about the odds of running into someone else on these lonely 13ers and they passed the register to me to sign. This one had been left by Mike Garratt in 2015, the third such register I'd found in three days - seems he's one of the more reliable sources for useable registers in the San Juans. The next logical summit on my route would have been to tag Lookout Peak about a mile to the west along the difficult-looking ridgeline. Given more time, I'm sure I could have made this work, but I was up against a time limit that didn't allow for much margin. I knew I could tackle Lookout from Ophir Pass at some future date and the more interesting peak at the moment was T12, located on the crest at the southern end of Bridal Veil Basin. 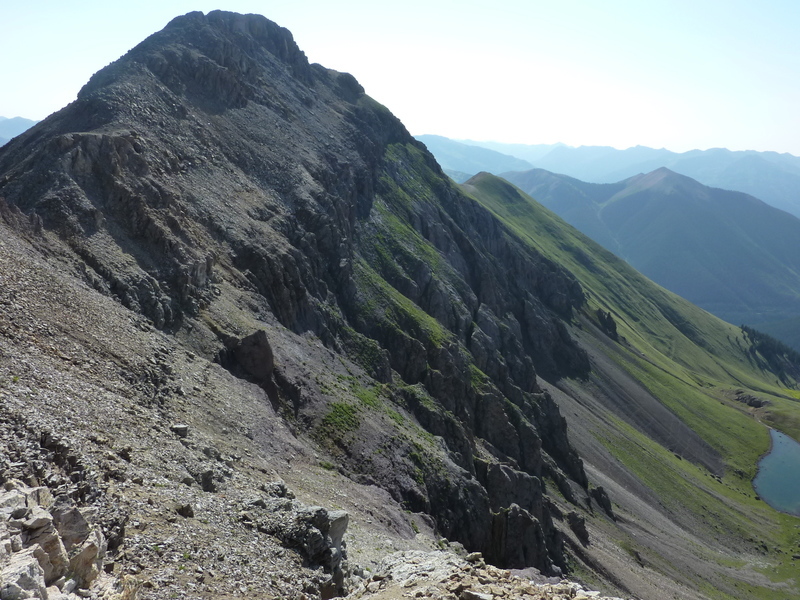 So I dropped off Peak 13,300ft, nearly down to Columbine Lake, following a high basin traverse along the base of Lookout Peak on its northeast side before climbing the talus/scree slope at the head of the basin to a saddle between Lookout and T12. I wasn't actually sure I could climb T12 from this saddle on its south side, but managed to find a class 3-4 route up the broken talus slope through a narrow chute that brought me to easier ground just below the summit. The easier route is probably from the east, but that seemed a bit inconvenient at the time. My descent route went off the north side with a bit more class 3 to negotiate before finding easier going as I dropped back into Bridal Veil Basin. When I reached the green meadows of the basin I was able to relax and enjoy the hour+ stroll back down the drainage. I eventually caught up with Eric and Steve around 1:15p, perhaps half a mile from the power station. They had paused to soak their feet in the creek here and were not surprised to find me close behind them. They reported having reached the Lewis Mill and their little adventure when the door they entered had locked behind them. The mill isn't open to the public but that doesn't seem to stop visitors, and upon entering they found the counterweight that holds the door open had come off its mooring. Some re-engineering of the assembly got it working again, but after exploring the inside of the mill they found there was a second exit in one of the lower floors. We hiked together back to the power station and the parking area, noting that some of the 4WD crowd have reading comprehension issues ( parking in obvious No Parking places). We drove back down to Telluride where we spent the rest of the day. No thunderstorms materialized this afternoon as the weather remained quite pleasant. Alas, he had to stay in New Mexico this trip. Eric's SO couldn't bear to be without the beloved Leroy for 10 days. Eric, yes. Dog, no.